Control, Alt, Delete…PC users are familiar with the keyboard trifecta used to reboot a locked-up computer. It doesn’t happen as much as back in the day when we used 286x-486x machines running Windows 3.0 or Windows 95 (if you’re under 30 and have no idea what I’m talking about, click here), but occasionally our computers, or specific applications, still get bogged down and the only way to fix the problem is the technological hat trick of Ctrl+Alt+Delete. Sometimes we need to reboot our leadership style. It’s easy to get comfortable leading in a certain way, and if we’re not careful, we can find our methods are out of date and no longer effective. Our leadership can get stuck in a rut…bogged down…and before you know it, people are no longer responding to us like they use to. If you find yourself in that situation, it’s time to hit Ctrl+Alt+Delete and reboot your approach to leadership. Ctrl—When you press the control key in conjunction with other keys on the keyboard, you can perform special functions (e.g., Ctrl+Home=move to top of page, Ctrl+End=move to bottom of page, Ctrl+C=copy, Ctrl+V=paste…you’re welcome for the tutorial on keyboard shortcuts). Pressing that key is all about control, and unfortunately, it’s easy to press it a little too much when it comes to our leadership style. Over-controlling leaders have an unhealthy need to be in power so they hold the reins tightly, never letting employees have too much freedom to do their jobs. If that’s you, it’s time to let go of control by empowering and trusting your people to do their jobs. They may not do it exactly the way you would, but if they’re meeting the right standards, let them add their own creative flair to their work. You’ll find they’ll be more engaged in what they do and produce better results. Alt—Pressing the Alt key allows you to access the alternate function of other pressed keys (e.g., Alt+Tab=switch between current open windows, Alt+F4=close current window). In leadership, there isn’t any one right way to lead; there are many alternate approaches. The key is to flex your leadership style and approach to meet the needs of the situation. If you’re stuck in a rut and what you’re doing isn’t working, choose an alternate approach. Let me suggest a few: trust and empower people rather than trying to control them, listen more and talk less, ask people what they think instead of always telling them the answer, get to know your employees as people and not just workers showing up to do a job, or offer some words of praise for a job well done instead of being so quick to point out mistakes. Any of those would be good places to start. Delete—Thank heavens for the delete key! If we type or create something we don’t want or like, a little tap of the delete key instantly erases it. 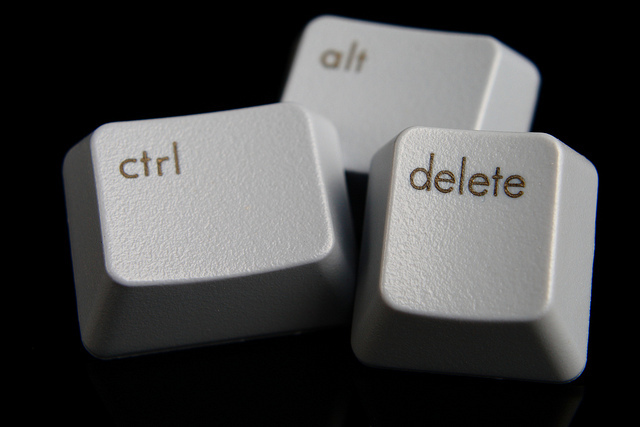 The delete key is the final and most critical key to press when rebooting your computer, and the same is true when rebooting our approach to leadership. We have to regularly delete the leadership behaviors no longer serving us. Times change, new generations enter the workforce, the business climate constantly evolves, and it’s imperative for leaders to stay current and relevant. If you frequently find yourself justifying your leadership behaviors by saying thinks like “It’s always worked in the past,” or “I’m used to doing it this way,” then it’s definitely time to reboot your leadership. It’s easy to get bogged down in the day-to-day grind of leadership and start to lose effectiveness. It’s important to occasionally reboot our approach to leadership by letting go of control, choosing alternate approaches to how we lead, and deleting the behaviors getting in the way of our success. Do you regularly reboot your leadership? Feel free to leave a comment with your thoughts. I think reboot in leadership should be used only as taking up some new approaches and leaving some previous one but not completely shut down and restart as reboot would mean for a computer. If someone feels that the situation is so wrong that a complete restart would be needed then he or she should not restart only the leadership but should go one more step back and start as a stuff member to learn again what he or she had forgotten to be a successful leader again one day or to find out that he or she is better as a key team member instead of the leader. Regarding the tryout of new approaches I think it is also valuable to list a few ones which should be always in the inventory of anyone who is leading a team: to listen, to serve and sometimes to get involved into the daily activities. If these core elements are always in use then the team as an entity will try everything to survive any difficult situation or to solve any difficult problem which will mean that significant Ctrl+Alt+Del will not be needed for the leader only the tryout of some new ideas and the release of some old ones from time to time which is of course definitely needed. Great insights Daniel. I was viewing a reboot as more of a situation where you have to do a “reset” – clear out the old stuff that isn’t working and start fresh. Of course it’s important to retain the core values and operating principles of your leadership philosophy, yet change your methods to meet today’s demands. Great analogy Randy – funny how timing works I just posted on a similar topic over on my blog tonight. Always important to examine our leadership and our lives on a regular basis. Such an important discipline for growth.